Fun fact about our family: My kids call their grandma Pumpkin. So, in the fall every time I hear my kids pointing out a pumpkin on someone’s front porch, my head is turning to look for my mom. Pumpkin is also fun to cook with. (Am I talking about the vegetable or my mom? ) ; ) That’s why we made these yummy pumpkin Nutella pancakes. To make these pancakes, I doubled the recipe on the back of the Bisquick box, but instead of using 4 eggs, I used 3 eggs and 1/2 cup of pumpkin puree. Just the canned Libby’s stuff in the baking aisle works for me. 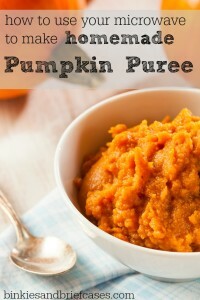 Or you can see how I have used the microwave to make homemade pumpkin puree out of real pumpkins. They are kid and husband approved and I liked that, because of the pumpkin, they weren’t just empty carbs (granted, there were plenty of those too) and they kept the kids full until lunch time. They also froze and reheated well. 1. Mix Bisquick, milk, beaten eggs, and pumpkin puree until it resembles traditional pancake batter. 2. Ladle pancakes onto hot, butter skillet. Use a spoon to drizzle a Nutella swirl into each pancake as it cooks. 3. Fry until golden brown, flip when bubbling in the middle. Nutella inside pancakes will be HOT. Allow to cool slightly, especially when serving to children. They are so yummy! I definitely need to make these again very, very soon! I need to make them again, too, now that the weather is getting cooler. They are a great fall breakfast. Glad you like them!